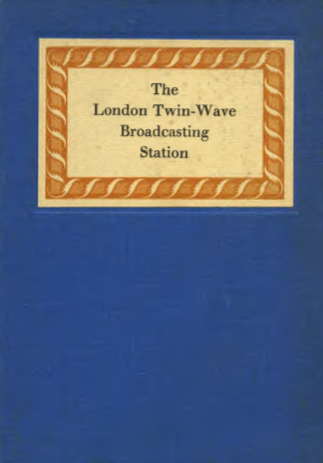 This history of The London Twin-Wave Broadcasting Station Brookmans Park is a "Descriptive Souvenir" produced by the BBC in 1930, and reproduced on this site after obtaining permission from the BBC. The Regional Scheme, for providing a broadcast service over the United Kingdom, consists of a number of stations, each containing two high-power transmitters. Thus in each Region two different programmes will be available at sufficient strength for reception on inexpensive apparatus. Furthermore, over the greater part of the total area served by these stations, the strength of the two transmitters will be similar to a sufficient degree to ensure that each programme can be listened to without interference from the other, when using the simplest types of receiver. The first step towards the realization of this scheme was the erection of the experimental transmitter at Daventry known as 5GB. Based on the experience gained by this and other means, the Engineering Branch of the B.B.C. prepared a specification for a complete Regional Station. The first station to be built in accordance with this plan is now in full operation at Brookmans Park, and a description of it is contained in the following pages. 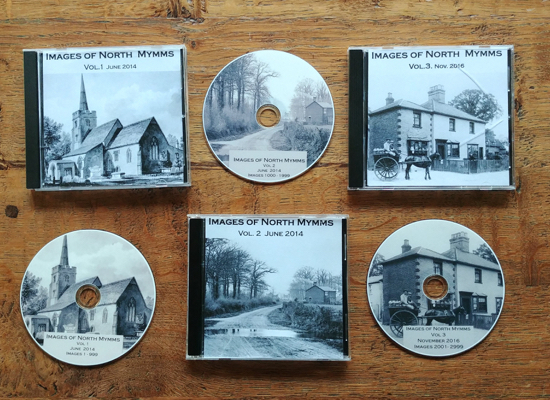 Perhaps the most difficult problem which the designer of a Broadcasting Station has to face is the selection of a site which will meet the various essential requirements. Naturally the first step is to consider the exact nature of the service which the projected station is to give, and the circumstances in which the service will be received by the listening public. The main object of the new London Station is to provide, for a region which consists mainly of London and the South-East Counties, a service of two contrasted programmes, both of which must be sufficiently strong to permit the use of inexpensive receiving apparatus. 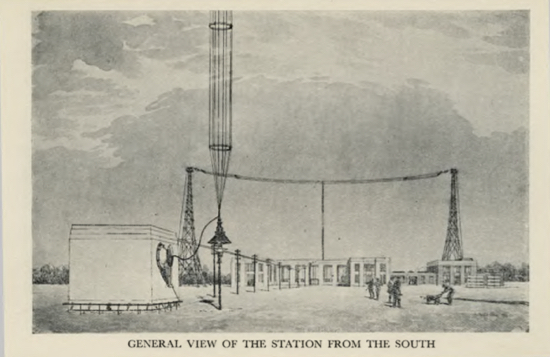 Moreover, the important fact that the service had hitherto been provided by a transmitter situated in the heart of London had to be carefully borne in mind, because this transmitter gave overwhelming strength in all districts within a radius of, say, three miles, in spite of the fact that its power was comparatively small. Naturally this fact affected the type, and even the condition, of receivers used by listeners living within this area, the result being that if an attempt was to be made to distribute the energy more evenly over the whole region by moving the site and raising the power of the transmitter, some dislocation was bound to occur in the immediate neighbourhood of the transmitter which was being replaced. This difficulty would disappear to a large degree were the designer free to choose any wavelengths he liked for the new station. However, it is now well known that the scarcity of wavelengths available for the broadcasting services of Europe is a severe handicap to development. Moreover, most of the wavelengths which are available are scientifically not the best possible for the purpose. As the direct result, the broadcasting station which does not possess one of the much-coveted long wavelengths (160 to 224 kilocycles per second; 1875 to 1340 metres) is automatically limited in the range it can give, however much power can be radiated by the aerial. The economic power for the two wavelengths to be used at Brookmans Park cannot be laid down as a hard and fast quantity, but may be considered to lie between 30 and 50 k.w. of energy in the aerial, and the maximum range in these circumstances is of the order of eighty miles. This, of course, assumes high quality reception, although, if the standard is lowered, the range is increased to a very large extent; but the B.B.C. 's Regional Scheme has been designed on a basis of high quality, and therefore the above range has to be assumed. These considerations largely determined the power to be used at Brookmans Park. It was almost out of the question to consider building the new station close to the site of the old, owing to the large amount of space required for the twin transmitters and aerials, but, even apart from this difficulty, it would have been inadvisable for several reasons. Perhaps the most important of these was the fact that the surrounding buildings would have absorbed a large proportion of the energy radiated and so produced wide variations in the amount of radiation in different directions. The question then arose as to how far from London the site should be. The dislocation effect has already been mentioned, and this in itself indicated that it would be inadvisable to go much more than fifteen miles away from Oxford Street, in which the old station was situated. Otherwise, of course, the existing insensitive receivers in the central districts of London would have become useless to their owners. It was eventually decided that the station should be approximately due north of London and at a distance which was compatible with the above facts. The reasons for choosing a northerly direction are many, but it is only necessary to mention a few. In the first place, there were Government restrictions which made certain districts out of the question. Again, it was necessary to be near one of the modern Post Office cable routes, in order to connect the new station with Savoy Hill by high quality telephone lines suitable for carrying music. Further, it was obviously desirable not to waste any serious amount of energy over the sea. Several sites were considered, but none had the advantages of the remarkably flat stretch of land at Brookmans Park, on which the station now stands. It is fifteen miles from Charing Cross as the wireless waves travel, and stands some four hundred feet above sea level, and is therefore one of the highest points in Hertfordshire. The buildings face the old Great North Road, on the other side of which is Brookmans Park itself, part of which is now rapidly being converted into a building estate. 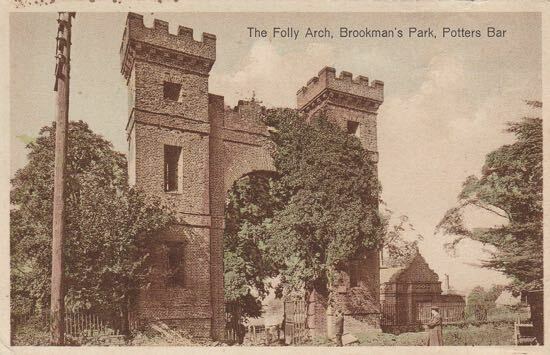 Brookmans Park gets its name from the family which held it in the reign of Henry IV. John Somers, the great Whig Lord Chancellor, lived in a stately old house on the estate, which was burnt down about thirty-five years ago. The mansion which replaced it was the home for many years of the Gaussen family, who sold it to the present owner. The Broadcasting Station occupies what was once a single field of some thirty-four acres in extent. The building is of a somewhat peculiar shape to conform to the best possible lay-out of the plant, all of which is on the ground floor. The first portion of the building has two stories, but the upper story does not house any of the essential apparatus. The office block, transmitter hall, and motor generator room, are faced with Portland stone, and the power-house, battery room, and repair shop, which are situated behind the main building, have a multi-coloured brick facing. There are two aerial systems, one for each programme, and each aerial is supported by two 200-foot self-supporting insulated lattice steel towers. These are placed on either side of the building, parallel with each other. Beneath each aerial there is an aerial transformer house, approximately eight feet square and faced with cement to harmonize with the main building. The earth system consists in each case of eighty copper wires radiating from the aerial transformer house in all directions and buried one foot below the surface of the ground. The process of generating the high-frequency energy for the two aerials really begins at the back end of the building, with the generation of power in the form of direct current at 220 to 230 volts. Outside the building one encounters first of all the two main oil tanks which, when full, contain a sufficient supply of fuel for several months’ working. Between the two oil tanks there is a wooden tower for cooling the water circulating in the engines. Next comes the power house itself, containing the four six-cylinder Diesel engines driving direct-current generators, each capable of an output of 200kw. Three engines are sufficient for running the two transmitters on full power, the remaining engine being held in reserve. A small compartment adjoining the engine-room contains a boiler heated by the exhaust gases of the engine. This boiler provides sufficient hot water to heat the whole building, but an auxiliary oil-fired boiler is provided for heating purposes when no engine is running, in order to make certain that the apparatus shall be kept dry at all times. Elaborate precautions have been taken in the design of the engine bed to remove the possibility of any vibration reaching any other part of the building, it being particularly necessary that the transmitters should not be subject even to slight vibration. The main battery room adjoins the power house. This contains a lead storage-battery of some 2,000 ampere-hours, one object of which is to provide a supply of current for a short time during an emergency. It also serves to light the building, and to provide a small amount of power when neither of the main transmitters is in use. Still proceeding towards the front of the building, next to the battery room there is a closed-in space where lorries can unload, and beyond this there is a repair workshop and a store for spare parts. Along one side of the battery room, packing space, and a workshop, there is a passage-way, to the roof of which are fixed the bare copper feeders running to the motor generator room. 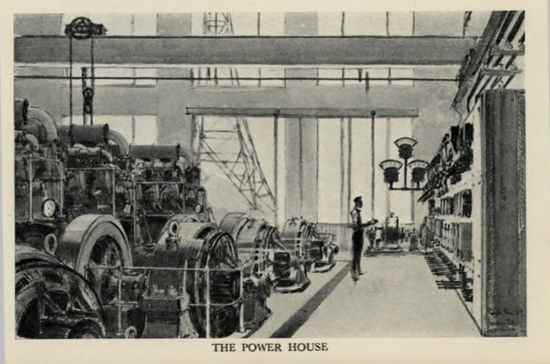 This room contains altogether fifteen motor generator sets which convert the energy received from the power house at 220 volts to the various supplies at different voltages which are required for feeding the actual wireless transmitters. In the middle of the room there are three 160 k.w. 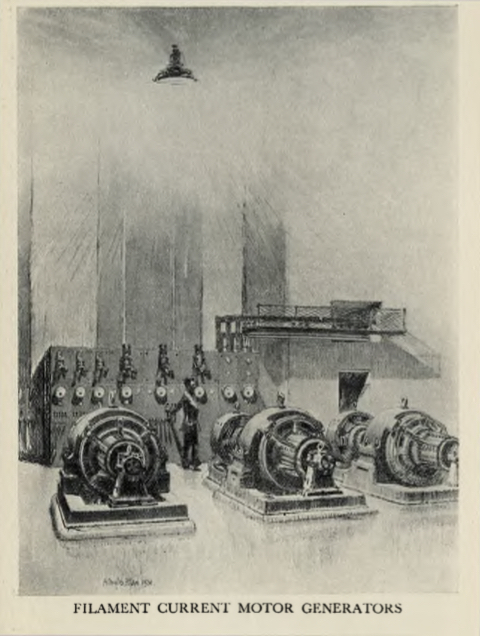 machines, generating current at between 10,000 and 11,000 volts. This constitutes the supply to the anodes of the main power-valves in the transmitters. Owing to the danger to life due to the high voltage generated by these machines, they are enclosed by a steel grill, the doors of which cannot be opened without shutting off the current. To the right, looking towards the front of the building, there are three machines each capable of producing 1,300 amperes at approximately 23 volts. This current is for heating all the valve filaments in the transmitter with the exception of the 'master oscillator' or 'drive' valve, the filament of which is heated by a separate battery installed for this purpose only. At the opposite end of the room there are nine groups of small machines for supplying the anode current for the low power stages of the transmitters, and for grid negative potential for all the stages with the exception of the 'master oscillator', for which no external grid negative potential is necessary. In every case three machines of each type are installed: one for each transmitter and one in reserve. 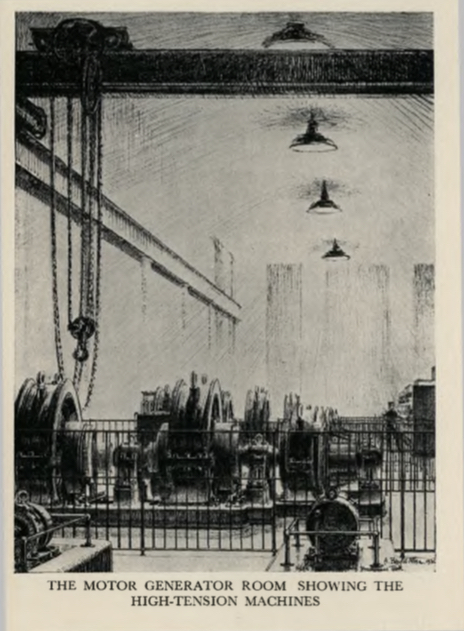 The cables carrying the outputs from all these machines pass through earthenware ducts to the vault below the transmitter hall, which adjoins the motor generator room. 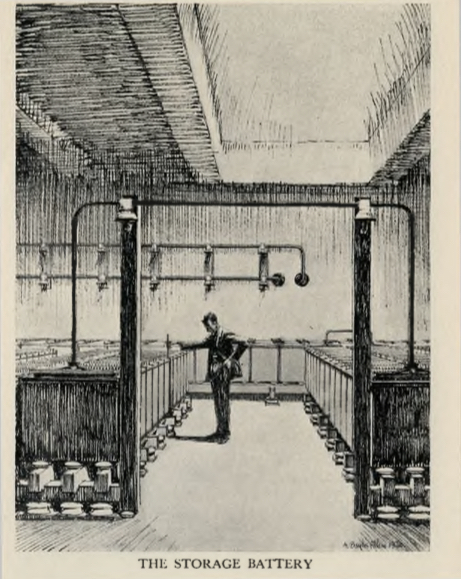 The main switchboard for feeding the various supplies to the transmitters is mounted along the end of the transmitter hall, and all leads running to it from the motor generator room, and from it to the transmitters, are mounted on racks fixed to the walls of the vault. 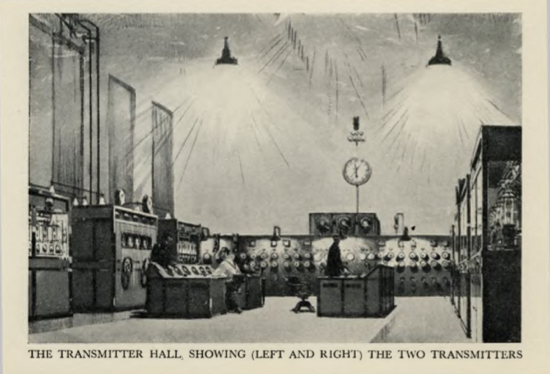 Running along each side of the hall, facing each other and at right angles to the switchboard, are the two transmitters, each of which consists of five separate units. These units are completely enclosed and are constructed of polished aluminium framework with enamelled steel panels. This type of construction provides the necessary amount of screening to prevent interaction between the various units. The two transmitters are identical in construction, and operate on the principle known as 'choke control at low power'. That is to say, the high-frequency oscillations are first of all generated at low power, then modulated, and afterwards magnified to the full power of the transmitter. Beginning at the opposite end from the switchboard, the first unit contains the 'master oscillator', the separator stage, the sub- and main modulator stages, and the modulated amplifier. All the valves in this unit are air cooled. The second unit contains two water-cooled valves connected in 'push-pull', water-cooled valves being used because this is the first stage in which any considerable amount of power is used. The third unit contains one-half of the total number of valves forming the final power stage, the other half being contained in the fifth unit, which is really a duplicate of the third. These two groups of valves are connected in 'push-pull'. The fourth unit contains the high-frequency tuning circuits, to which are connected the high-frequency feeder lines, which run out at right angles from the building to the aerial transformer house. The doors of all these units, with the exception of the one handling high-frequency currents only, are provided with an interlocking system of switches, which makes it impossible to open any door without automatically switching off the power. This is unnecessary in the case of the fourth unit, containing the high-frequency apparatus, because no fatal voltages exist. In each stage a spare valve is mounted in position and ready for use, and it is only necessary to close a switch to bring it into operation. In the middle of the hall there are two control tables, each facing the transmitter which it controls. An engineer sits at each of these control tables and from it he can operate the transmitter and adjust the various input voltages without leaving his seat. Circulating water for the water-cooled valves used in the power stages of the transmitters flows by gravity from two tanks (one for each transmitter), mounted on the roof of the building, and after passing through the jackets of the valves it flows into two tanks situated in the vault. It is then pumped through two banks of tubes mounted over a concrete pond outside the building. After passing through this cooler the water is returned to the tanks on the roof. Water is pumped over the outside of the banks of tubes in order to cool the hot water flowing through them. Thus it will be seen that the water which actually comes in contact with the valves is entirely enclosed, which allows the use of soft water, without the necessity of constant replenishment. Adjoining the transmitter hall, on the ground floor of the office block, are two control rooms, for handling the programme radiated by each transmitter. These rooms, which have windows communicating with the transmitter hall, contain the amplifiers and switch-gear for handling the music or speech before it is applied to the transmitter. Brookmans Park is connected to the studios at Savoy Hill by four Post Office telephone cable circuits, which are specially arranged to avoid distortion. On arrival at the Brookmans Park control room, the music is amplified to the correct strength and is then passed to the sub-modulators in the main transmitters. The remaining space on the ground floor of the office block is occupied by offices, a spare valve room, a garage, and a waiting-room for visitors. On the upper floor there are two rooms for checking (on loud speakers) the quality of the transmission, and a test-room for taking precise measurements of the performance of the transmitters. There is also a studio, which is used normally for tests, and a room which has been left vacant for the installation of tuning-fork drive apparatus, should it ever become necessary to operate one of the transmitters on the same wavelength as another at one of the other Regional Stations. The studio is used for testing and, in the event of a complete failure of communication with Savoy Hill, to make an announcement and carry on a programme while the lines are being repaired or changed. For the interest of visitors the first transmitter ever used by the B.B.C. (the original 2LO) has been placed in the studio. This was originally installed in Marconi House, and provides an interesting contrast with the latest design as seen in this station. At the opposite end of the office block from the studio there is a kitchen and mess-room for the staff. The two wavelengths used are 356 metres and 261 metres, and each transmitter is intended to work with a power of thirty kilowatts in the aerial. The former wavelength radiates the Regional Programme, which will be designed to be of particular interest to the London Region. The National Programme, which will be of general interest throughout the country, is transmitted on 261 metres. Since this wavelength is considerably lower than 356 metres, the range will be somewhat less. 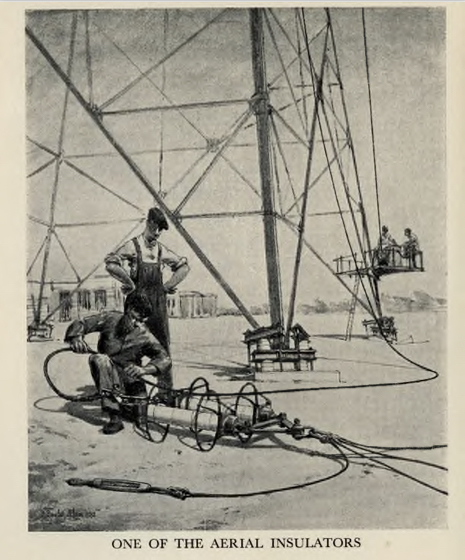 In order to equalize the strength received from the two transmitters over as wide an area as possible, arrangements have been made to enable greater power to be radiated by the lower wavelength: that is to say, the one on which the National Programme will be sent out. 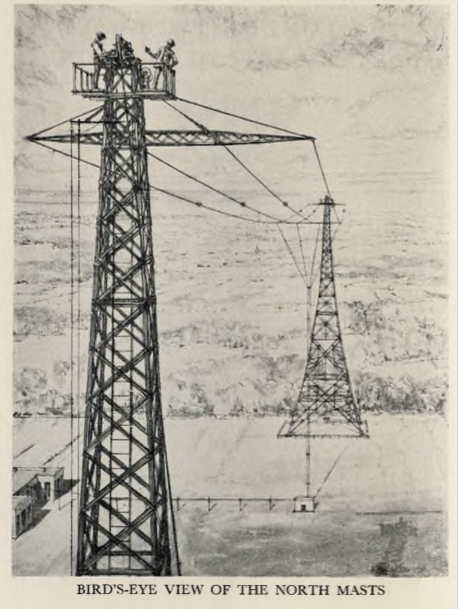 The transmitter used for this service delivers approximately 45 kilowatts to the aerial, but even so it cannot cover so great a service area as the transmitter working on 356 metres. However, since the Daventry transmitter 5XX, using 1556 metres, will always transmit the National Programme, listeners who cannot receive this programme satisfactorily on the Brookmans Park wavelength of 261 metres, can always make use of the long-wave Daventry transmitter. Messrs. The Anglo-Scottish Construction Co., Ltd.
Messrs. Marconi's Wireless Telegraph Co., Ltd.
Messrs. The English Electric Co., Ltd.
Messrs. Ruston & Hornsby Ltd.
Messrs. The D.P. Battery Co., Ltd.
Messrs. Drake & Gorham Ltd.
Messrs. Haslam & Newton Ltd.
Messrs. Rosser & Russell Ltd.
Messrs. The Foundation Co., Ltd.
Messrs. 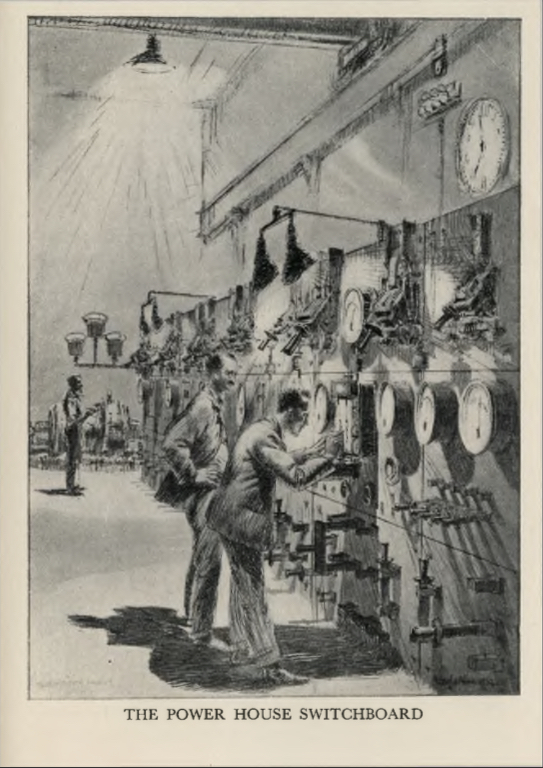 The Dubilier Condenser Co., Ltd.
Messrs. Johnson & Phillips Ltd.
Messrs. United Stone Firms Ltd.
Messrs. Crittall Manufacturing Co., Ltd.
Messrs. The Synchronome Co., Ltd. Copyright note: The source of this booklet is the BBC, which has given permission for it to be reproduced on this website. No further copying is allowed and no other reuse without the BBC's permission. The illustrations have been drawn by W. Baylis Allen.